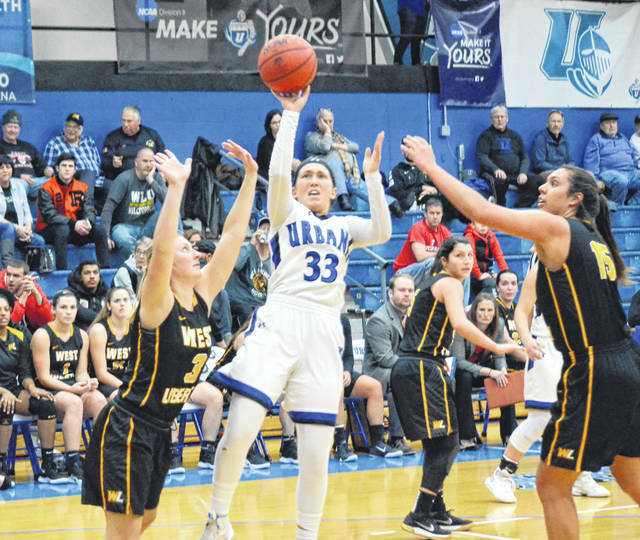 Urbana University’s Megan Beachy (33) shoots a fade-away jumper between a pair of defenders on Wednesday versus West Liberty. Eighth-ranked West Liberty University defeated Urbana University, 91-78, in MEC men’s basketball on Wednesday at the Grimes Center. The home team never led in the contest, with the Hilltoppers holding a 41-35 advantage at halftime. For the Blue Knights, Ethan Snapp led the squad with 17 points, while Malik Jacobs and Jordan Bradley added 15 each. UU (5-10) plays at Notre Dame College on Saturday. Visiting West Liberty University defeated Urbana University, 80-71, in MEC women’s basketball on Wednesday. The Hilltoppers outscored the home team 38-33 in the first half and used a better shooting night at the stripe to earn the advantage. The visitors shot 23-of-29 from the fre- throw line to UU’s 13-of-26. Sylvia Hudson scored 29 points and Megan Beachy had 10 for the Blue Knights. Erin Morrow added 9 points and 12 rebounds. UU (1-14) plays at Notre Dame on Saturday. https://www.urbanacitizen.com/wp-content/uploads/sites/36/2019/01/web1_MeganBeachy012319.jpgUrbana University’s Megan Beachy (33) shoots a fade-away jumper between a pair of defenders on Wednesday versus West Liberty.